In Place, Race, and Story, author Ned Kaufman has collected his own essays dedicated to the proposition of giving the next generation of preservationists not only a foundational knowledge of the field of study, but more ideas on where they can take it. 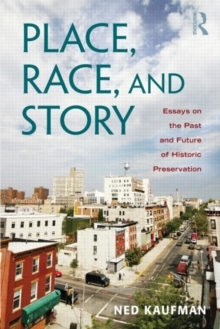 Through both big-picture essays considering preservation across time, and descriptions of work on specific sites, the essays in this collection trace the themes of place, race, and story in ways that raise questions, stimulate discussion, and offer a different perspective on these common ideas. Including unpublished essays as well as established works by the author, Place, Race, and Story provides a new outline for a progressive preservation movement - the revitalized movement for social progress.